You might have started to notice a trend. Actually, if you’re like me you’ve noticed it and have already developed a complex love-hate relationship with it (Ok, maybe that’s a little much). It’s called “Click to Tweet”. It’s a really simple and effective tool that puts a quote from your article smack dab in the middle of the content that makes it dirt simple for your readers to do exactly that: “Click to Tweet”. But like any tool, it can be abused, or misused, or overused. I *think* it can be useful, but chances are high that it’ll rather be implemented in a less than stellar fashion, or be an annoyance or turn-off to your readers. Some users feel like it breaks up the reading rather than enhances it. More astute readers really don’t like you telling them what to share and how. Again, a feeling of cheapness, or “need for attention” (as some put it). I think what makes this technique unique is that it puts the Social Sharing right in the middle of the content. There have been a few write-ups bemoaning the utter uselessness of social share buttons. Whether you put them at the top of the article (before they’ve even read your article, really?!) or at the bottom (which many readers don’t even get to) they often times are just under-used or worse: obnoxious. That’s what makes this different. It’s not a button, it’s text like a blockquote. And it’s not at the bottom or top of the article. Still, so far the response from most I spoke to was luke-warm to negative. Can it be done Well? This is a good question. Honestly, there has been only one post I’ve seen so far that did it really well. The folks at WPSiteCare put together this really comprehensive list of a ton of WordPress plugins and scattered several well-worded quotes about them throughout the article. This was genius because the article was all about OTHER people’s work, and gave them a super quick way to promote themselves while pointing the social media links to the WPSitecare site. Clever and well executed. If you’re using Click to Tweet and it’s been effective, I’d love to hear about it in the comments. All of this reminds me once again that the success or failure of your blog article never lays within the usefulness or cleverness of a plugin or social media trick. It always — ALWAYS — depends on how well written and useful your article is. So here’s an encouragement. This week, when you want to spend time on your blog, rather than research all over the web for better ways to “get” social shares, research ways to become a better writer, and try writing at least 20 minutes every day. I guarantee that your social channels (and your readers!) will thank you for it. For now, I’m using this plugin for the Tweet to Click functionality. Next Next post: Fear Not for Your Tax Exempt Status is With You! I don’t use it on my blog but only because it’s not as easy as I’d like it to be. However, if the person uses a great thought, it’s easier. People do easy things. Where I see the fail is the lack of response to said clicked tweet. So, I tweeted this out for you, Mr. Blog Writer. Do I get a thank you? Or is my tweet ignored? I ole them but am with you, they can really be overdone, misused, and tacky. When used sparingly and appropriately, though, I think they work well. I notice high click-throughs when they’re done well. I wanted to play with mine more though, so I am glad you have me another link to check out!!! There are a lot of blogs who use twetable quotes very succesfully and elegant. for elegance, for example, you can check out the TweetDis plugin for WordPress. First off, thanks for using my plugin! I agree wholeheartedly with everything you said here, in that the tool facilitating the click to tweet box is not nearly as important as creating something that is useful to both the reader and that reader’s friends. That being said, I think that an elegantly styled box is much more likely to get a click through. That’s why I’ve given my users the ability to customize the appearance of their clicktotweet boxes, without the premium price tag of tweetdis. Check out http://benlikes.us/bcttcustom for the guide on how to customize it! That would allow the user to have multiple styles. Just a thought. Thanks for your contribution! I am using Better Click To Tweet. I’m actually less concerned with getting the actual tweet than getting specific quotes to stand out. I could do that with images but it’s a whole lot more work. The additional SEO value of the image isn’t worth the time and at least the plugin gives me the possibility it will get tweeted. I like Robert’s point. 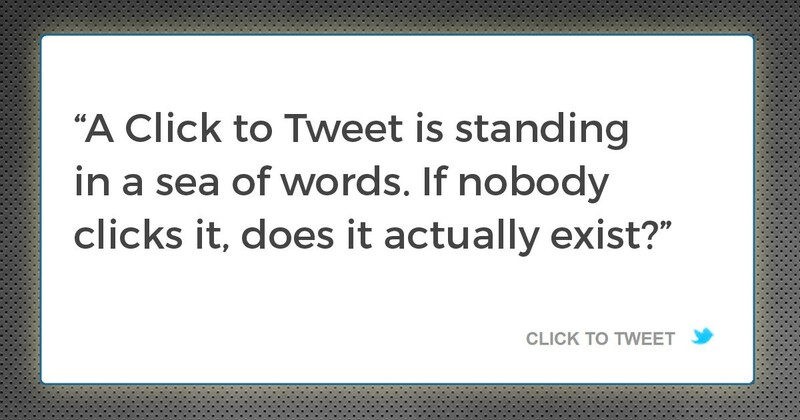 Click to tweet is a nice way of having a quote standout. If it encourages sharing, and varied sharing messages, that’s an awesome bonus. I don’t think it’s a binary. Tools are tools, use ’em, customize ’em, whatever. I only use “click to tweet” when there’s something worth highlighting in the text. Bottom line, as you said, is write good stuff. Definitely not a hard-truth/answer kind of question. By and large the examples I’ve seen have just been stock out of the box uses and it feels artificial to me. But then my good friend Chris Ford pointed out that she uses it on her site. Check out this article, it’ll take you a minute or two to notice the Click the Tweet because she styled it in a very intuitive way that flows with the content really well.